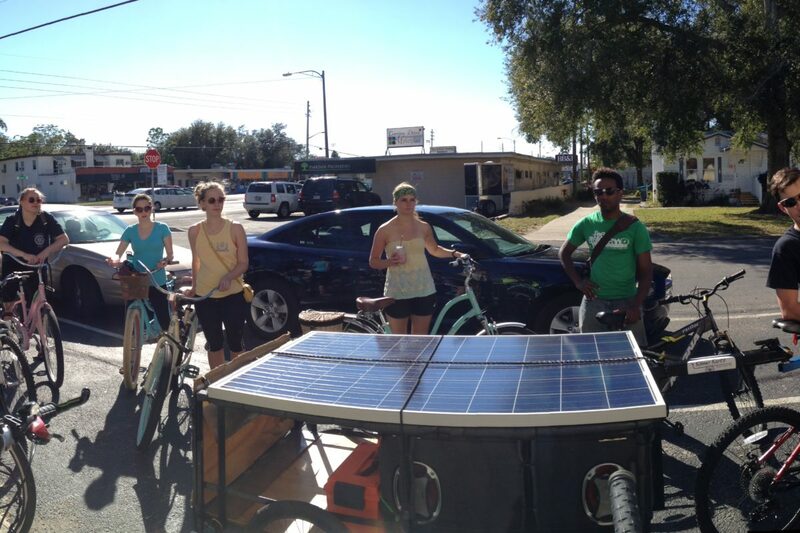 A sustainable food initiative in Orlando, Florida is aiming to prove that as long as there are bikes and suburban lawns, supplying produce for a city doesn’t have to leave a carbon footprint. Fleet Farming uses volunteers to tend organic vegetable gardens in private yards. 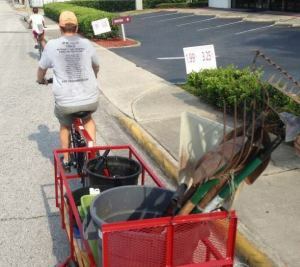 The produce is then collected and brought to local farmers’ markets and restaurants via pedal-power and the entirety of this mini food system is located within a 10-mile roundtrip bike path near downtown Orlando. By some estimates as much as 33 percent of global climate change is caused by our energy-dependent food delivery systems. And while the food miles equation has been shown to be more complicated than it once appeared, the average meal still travels over 1,500 miles before reaching your plate. Fleet Farming is the brain child of John Rife, the founder of Orlando’s East End Market, which brings together area farmers and food artisans under one roof. Rife presented his vision of pedal-powered farming at The Hive, an inter-generational community think tank which brainstorms sustainable living ideas. The Hive is an initiative of IDEAS For Us, an Orlando-based nonprofit organization accredited by the United Nations that brings awareness to environmental issues. Rife’s December 2013 presentation became a pilot program by February of 2014. Florida’s year-round growing season meant there was no reason to delay. The goal was to start small and scale up over time. “We wanted to know what was the fastest growing plant, what had the quickest harvest, and what were people interested in eating,” said Castro. Homeowners who sign a one-year contract with Fleet Farming receive a portion of the harvest in return for use of their land. They aren’t required to do the work, Castro hopes that many of them come to see the value of gardening. Volunteers, who come from area high schools, colleges, and via social media invitation, tend the gardens every week. Each month, the group comes together for a “swarm,” a public bike ride that includes stops at all the gardens. Anyone interested in learning about farming and improving the food system is invited. Bikers visit the farmlettes to work and learn. Once the food is harvested, it is biked to two neighboring farmers’ markets. Local restaurants and a food distribution company will also utilize the produce. As the pilot program ended in June, Fleet Farming was granted $5,000 by the Healthy Central Florida Foundation to continue its work. The program will now expand to 15 homes with a combined 2,500 square feet of growing space. Is the project legal? According to Heather Grove, Community Manager at East End farmers’ market, “Fortunately for the City of Orlando there are no laws that prohibit selling produce from community or home gardens. However, there are no laws that specifically make it legal either.” The Central Florida Good Food Policy Council–a group Grove is part of–is working to address the code to bring it in line with recent pro-urban framing changes that have taken places in Atlanta, Georgia. While the project is only one piece of a complex food puzzle, it’s also a smart way to put land and water to use in a place where lawns currently occupy acres and acres of land. Photos courtesy of Fleet Farming. Neat project. I think we should be trying sustainable initiatives like this all over the country to see what works, what doesn't, and what can scale. Seriously, you may need to double it!